WAKEFIELD Trinity prop Anthony England makes a swift return to Warrington Wolves tomorrow night insisting all he wants is a win. The ex-Dewsbury Rams and Featherstone Rovers front-row got his first chance of Super League action with Tony Smith’s side in 2014 and played 31 top-flight games for the Wolves. 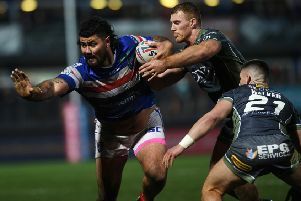 He switched to Wakefield in the off-season, though, and after Trinity secured their first win of the season at Hull KR on Sunday they head to the Halliwell Jones Stadium in high spirits. “It should be good going back to Warrington and seeing all the old boys,” said England. “My time there was great for me as I was coming from the Championship and quite late on as well – I think I was 26. “I felt it was time to go to another level and get that experience at a big club. The game, of course, pits Wakefield boss Brian Smith against his younger brother Tony, the Warrington coach. Trinity welcome back Nick Scruton from injury with Scott Anderson injured and captain Danny Kirmond still not fit.